Before there was Guitar Hero and Rock Band, there was GuitarFreaks. Konami’s not new to simulation games. Some even consider Konami the founders of simulation games. 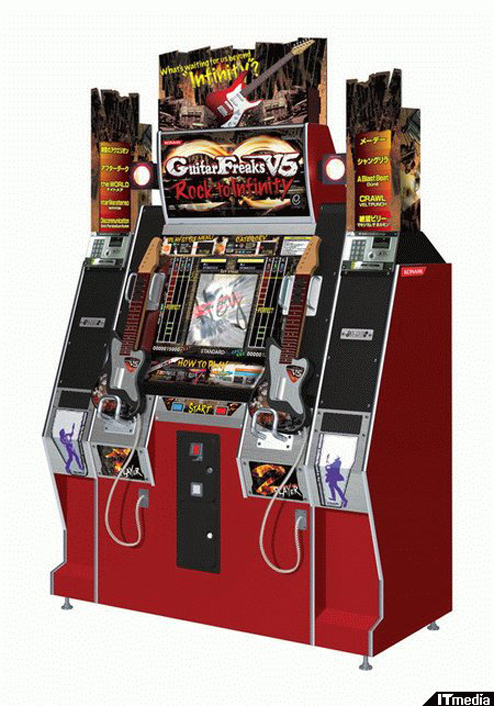 Dance Dance Revolution, GuitarFreaks, DrumMania, and Dance Maniax are just a few under Konami’s belt. Even though the arcade scene here in America has been on the decline, it is still somewhat popular in Japan. Last week Konami revealed the latest GuitarFreaks machine. This is the fifth version since GuitarFreaks was created in 1999. Along with the new GuitarFreaks game, Konami also released the fifth version of DrumMania. These system puts the current Guitar Hero and Rockband song totals to shame at around 500. Just thought I would educate you on how everything cool does indeed come from Japan. Via Kotaku.